Her name is snowflake, after trying so hard to figure out a name I was watching tv and heard someone say look at all the snowflakes and that's when it hit me SNOWFLAKE = no two snowflakes are alike and neither were her eyes, so Snowflake was the winner and it fits. I would like to add that we have had both girls for 2 months now and have come to discover that our snowflake is deaf. We are not sure if it is in both ears or one. Most of the time it seems to be both, but then she will respond to things that makes us still wonder. Thanks for your story about Snowflake. I'm really glad you went back the next day to get her! When I adopted my white cat Star, the people at the shelter said her name was Snowflake. I tried calling her that but she wouldn't respond to it. If you've read my story you know she chose the name Star. I'm glad your Snowflake liked her name -- I think it's a lovely name for a lovely kitty. I would love to see her picture. Both of the kitties you adopted are very lucky to have found such a loving home. 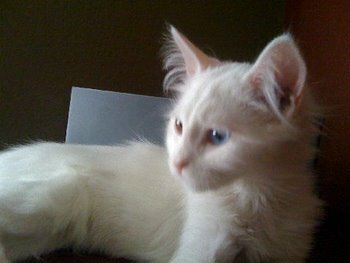 Everyone told me that white cats with blue eyes are often deaf, but I KNOW Star isn't deaf. She will often ignore me but when it suits her, you better believe she can hear the tiniest pin drop of a sound! She ignores me unless she chooses to hear what I'm saying to her! I wish you and your family many years of happiness withyour two recently adopted kitties. I always say, two cats are better than one. Double the love! My family used to have a white cat when I was little. He too had eyes of different color. I think these types of cats are so beautiful. And rare. I haven't seen one like that in a long time. I'm sure Snowflake is very beautiful. As to her deafness, white cats are prone to it. But I think they learn to compensate by developing their other senses. I'm so happy that Snowflake and her sister found a loving home.